Our faces change as we progress through life. However, we all age differently, and at different rates. Some people stay looking good, but for others, facial changes through ageing can become a source of distress. The way we age is largely genetic, but is influenced by health and fitness, weight, sun exposure history, smoking, and chronic over-expression (such as squinting in outdoor workers). Solar damage is particularly common in the Australian population, and causes premature wrinkling, skin surface problems, dryness, blotching, pigmentation, broken veins, scaly plaques and even skin cancer. Loss of facial shape, wrinkling, or a tired look around the eyes, cheeks or mouth can lead to a lack of self confidence, or even the perception that ageing is a threat to employment. What are the four elements of facial ageing? There are four major elements of facial ageing and once these have been determined, they can be used as a logical basis for planning surgery. The underlying bone and facial soft tissue shapes may be susceptible to premature ageing. For example, a retrusive or small chin may lead to early loss of jaw line definition. Bony prominences regress over time. Descent or drooping of structures such as the brow, jaw line, neck tissue and cheeks occurs over time, as well as laxity or loosening of tissues such as the folds around the mouth. Young people have full, plump facial tissue. With ageing, loss of volume in parts of the face such as the cheeks or lower eyelids can result in a drawn or tired appearance. Ageing causes changes in the texture of the skin, with wrinkling, loss of elasticity, pigment changes, broken veins and dry patches, mainly attributable to sun damage. These changes are usually more prominent in fair skin. Facial rejuvenation surgery refers to procedures used to restore, as far as possible, the youthful and natural appearance of the face and neck. The key to facial rejuvenation surgery is careful and expert evaluation: an accurate diagnosis of the individual pattern of ageing allows the best operative plan to be made. Then, if the procedure is performed to high standards, a pleasing result should be obtained. 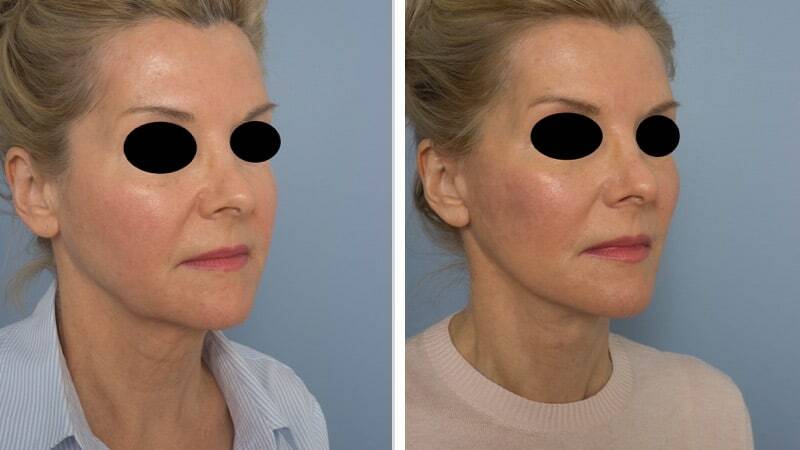 What kind of procedures are used for facial rejuvenation? 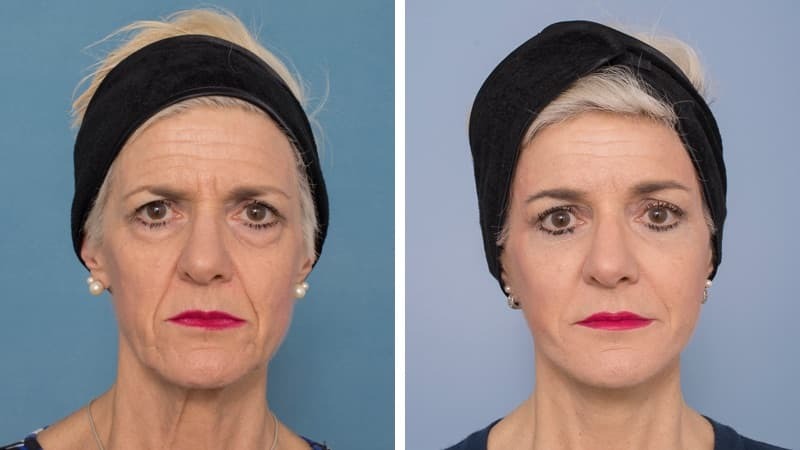 Face and neck lifting procedures including brow lift, several types of facelift and SMAS lifts, temple lift, several types of cheek lift and neck lift. These are designed to restore the shape of the face, and improve sagging or deepening of the folds around the mouth. The procedure mix selected for the individual patient depends upon the facial assessment, and the particular preferences of the patient. Volume correction procedures include facial implants, fat cell grafting and other filler injections. These improve specific areas of atrophy, flattening or loss of volume. Skin improvement procedures. Optimising your skin quality is always worth it and you may wish to establish a skin maintenance plan, including laser treatment, peels, and facial injectables. If you are considering facial or eyelid rejuvenation you will be carefully evaluated and we will discuss your options at length. Any or all of the contributing factors to facial ageing may be present in various degrees, so your treatment plans will be tailored to suit you. 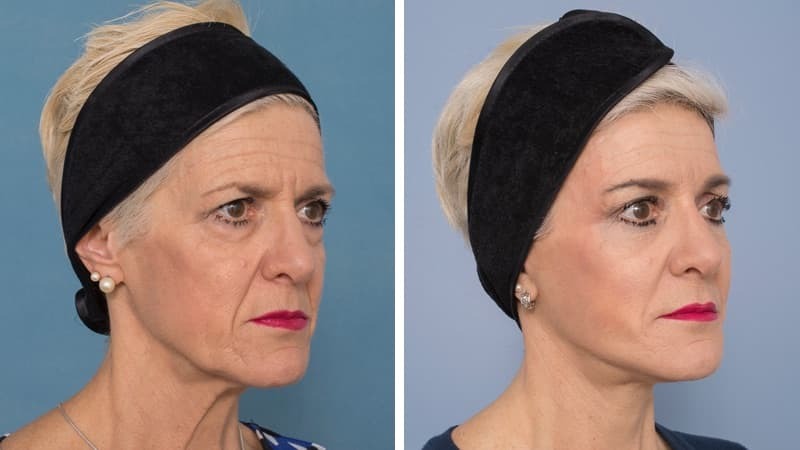 The best option may be a facelift with a rapid recovery, a procedure with minimal scarring, or a more major operation such as an extended SMAS procedure, depending on the degree and type of facial ageing. The final treatment plan may be simple if there is a single problem, or complex if several procedures are required. An example of a typical treatment plan would be a combination of face lifting, eyelid rejuvenation, and some laser resurfacing to smoothe wrinkles around the lips. The position of any scars will also be discussed and planned before surgery. If you are seriously considering facial rejuvenation, you should practise preventative skin care by using sun protection and not smoking. We can advise you on skin care, including the use of moisturisers, exfoliators and sunscreens. Absolutely no medication containing aspirin should be taken for two weeks before surgery. You must stop smoking two weeks before surgery, and abstain from smoking for two weeks after surgery. A general anaesthetic is often used, but in some cases it may be appropriate to use heavy sedation and local anaesthetic. Either way there is no pain and you will have little or no recall. 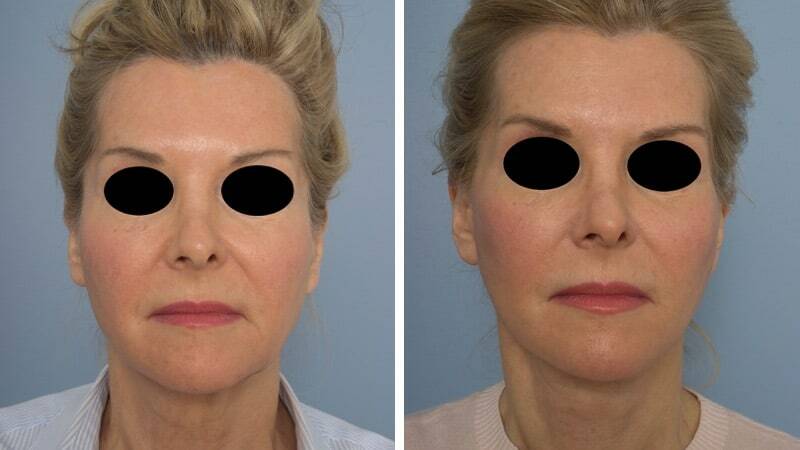 Facelifts and brow lifts require bandaging. Most other procedures have minimal or no dressing. Drain tubes are not usually necessary. You may have protective ointment placed in your eyes. If so, your vision may be blurry when you wake up. Most facial procedures result in discomfort, rather than pain, but medication will be given to limit any pain and nausea. The operated area may remain numb as we use local anaesthetic to minimise discomfort. We encourage you to start drinking fluids as soon as possible after surgery. We may place ice packs on your face to minimise bruising. Dressings at home are usually only a lycra compression device which is shaped to fit your face, and a soft neck collar. You can put these on and take them off yourself. At home you should set yourself up in a comfortable chair, couch or bed, with your head elevated. It is important not to overstretch your mouth or neck for about two to four weeks. Talking should be quiet, food should be in small, bite-sized pieces which require minimal chewing. This allows the tissues that have been tightened to heal without stretching. It is vital to maintain drink enough fluids. You begin to eat your normal diet when you feel ready. Discomfort can be expected but it is usually not severe and decreases quickly. You will receive dressing care instructions before going home, and any prescribed antibiotics or eye drops. You may resume driving once you are comfortable, can react quickly if necessary, are not taking strong painkillers and can see normally. After facelift or eyelid surgery, you can usually resume driving after seven to 14 days. You must avoid heavy exercise for at least three to six weeks after surgery. Unnecessary bending, stooping or heavy lifting within the first 10 days may cause postoperative bleeding. Obvious bruising and swelling will be visible for around two weeks, however it takes around two months to fully subside, so allow that long before attending important social events or being photographed. Complications related to facial rejuvenation surgery are uncommon, but may include bleeding that requires return to the operating theatre (haematoma), infection, skin or wound breakdown, small lumpy blood clots or scar tissue under the skin, nerve injury resulting in temporary or permanent loss of movement of part of the face, poor or obvious scarring, development of new wrinkles or creases in the skin on expression, and asymmetry. It’s important to allow plenty of time for recovery from this type of surgery. A period of psychological adjustment is common and many patients go through a variety of moods postoperatively. As they recover, and the postoperative period of swelling, fresh wounds and bruising passes, patients feel happier. After a month or so, most feel extremely positive. 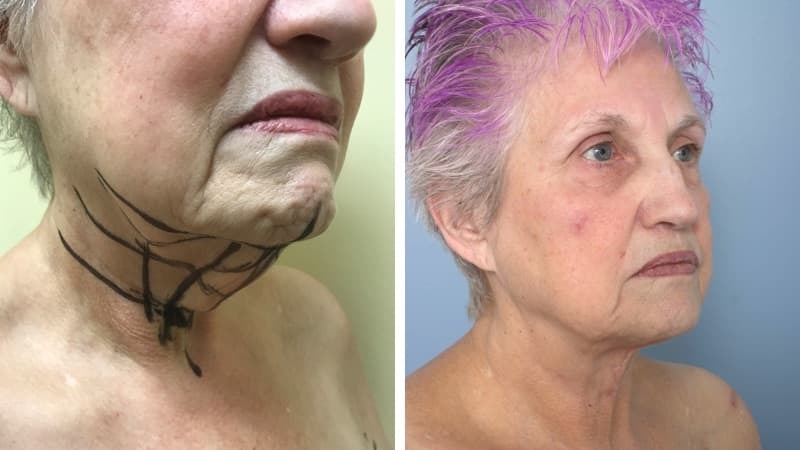 All patients having facelift procedures where the skin is undermined become numb in the cheek and temple area, in front of the ears, and sometimes in the upper neck. This may last for weeks or months and feels odd (‘wooden’), but it generally improves over time. The loss of sensation in the lateral cheek area doesn’t impact on appearance or function, but it does bother some patients for a while. Some patients feel uncomfortably tight around the neck area at first. This is normal. Lumpiness under the skin is also common in the first few weeks, but is usually more felt than seen. Facelifts change the hairline around the temple area. In some patients, there is temporary hair loss in the temple area due to the ‘stress’ of surgery on the hair follicles. Males having facelifts need to be completely aware of the potential visibility of the incisions, the changes in sideburn position, and the scar position in relation to their ears. Before you commit to having this surgery, it is important that you read the document “Consequences, Risks and Complications of Facial Rejuvenation“ and the equivalent document for any other facial procedure that you are considering.